MEMPHIS, TN--(Marketwire - May 29, 2007) - Medtronic, Inc. announced today that the medical education Website OR Live will feature a segment with Todd Lanman, M.D. and Russ Nockels, M.D. performing a lumbar fusion using Medtronic's CD HORIZON® LEGACY™ PEEK Rod System live on Tuesday, June 12, 2007 at 6 p.m. CDT. 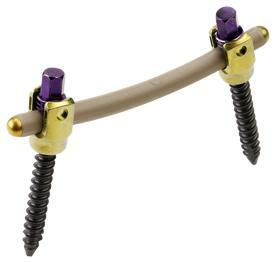 The CD HORIZON LEGACY PEEK Rod is suited for stabilizing the spine in conjunction with an arthrodesis procedure. The system allows for reduced stress on the screw-bone anchor points and construct instrumentation and better stress distribution throughout the construct. The PEEK Rod material is also radiolucent, reducing scatter and artifact in CT and MRI images. OR Live is a production of slp3D, an Internet broadcasting company which creates live and on-demand video-based communications solutions for clients in the healthcare industry. Medtronic's spinal business, based in Memphis, Tenn., is the global leader in today's spine market and is committed to advancing the treatment of spinal conditions. Medtronic's spinal business collaborates with world-renowned surgeons, researchers and innovative partners to offer state-of-the-art products and technologies for neurological, orthopedic, oral maxillofacial and spinal conditions. Medtronic is committed to developing affordable, minimally invasive procedures that provide lifestyle friendly surgical therapies. More information about the company and its spinal treatments can be found at www.medtronicspinal.com and its patient-education Web sites, www.back.com, www.iscoliosis.com, www.maturespine.com and www.necksurgery.com. Medtronic, Inc. (NYSE: MDT) (www.medtronic.com), headquartered in Minneapolis, is the global leader in medical technology -- alleviating pain, restoring health, and extending life for millions of people around the world.